DevOps is the fancy name given to a theoretical framework that, if put into proper practice, brings about a cohesive, seamless functioning of the development and operations teams of organizations. DevOps needs (and in effect, creates) a culture of knowledge and information sharing, that leads to collaboration between the various teams. The practice of DevOps principles not only is beneficial for the performance of software development and operations, but it also has a very positive impact on the web service development and quality assurance performance. Disciplined Agile Delivery is an established process for developing software, and it includes DevOps. DevOps helps to establish, and achieve an effortless Continuous Delivery process. Consideration of Perspectives: The cultural change must be considered from the perspective of both the driver and the participants. Flexibility: In case of exceptional situations, the organization must be flexible enough even to temporarily let go of DevOps values. Integration Process: A process must be in place to integrate the changes made. Agile Decision Making: The teams must have the agility to be able to decide the tools they need to use based on their own skills and expertise. Transparency: There should be no hidden agenda between the Dev and Ops teams. A DevOps culture is best defined as a way of open communication, sharing of responsibility, and mutual respect and trust. If the cooperation between the two teams is not handled optimally, it will have an adverse impact on productivity, software quality, and service quality. Working in a collaborated manner to achieve integration in today’s environment where, say, testing a mobile application requires testing not only the multiple devices from different manufacturers, but also multiple operating systems, is obviously very challenging, and requires a different approach. An established DevOps environment makes both the development and operations teams become each other’s customer and supplier. While the Dev team needs the Ops team to help manage systems for large scale information systems, the Ops team needs the Development teams’ assistance in developing tools and apps for the operating systems, and for implementing features to improve security, performance, and stability. In essence, this dependency forms the basis on which the bridge of DevOps can be built. While some perceive DevOps as a job description, others see it a skill set. DevOps practices can be classified including the concepts of quality assurance, services, and structures & standards. The different views of DevOps requires us to look at DevOps from multiple perspectives. This allows us to unite the conflicting definitions of DevOps under separate names, such as DevOps as a role in the SDLC process, DevOps as a skill set and DevOps as a conceptual framework for supporting development and operations of Information Systems. Once a proper DevOps environment has been established, it makes significant contributions to the growth of an organization. DevOps can make a significant contribution in the area of QA in Information Systems that links the development, operations, and customer support teams with the customers. QA is usually hard to predict and DevOps improves the QA process by bringing the aforementioned parties closer through cooperation and tooling. DevOps also provides more opportunities to gather more data today – as compared to the past. To have a greater impact, the responsibility of providing QA can be assigned to employees who perform both development and operations tasks. By using behavior driven operations (BDOps), the different roles around QA can specify how the system must deliver the desired UX. DevOps principles also prove beneficial in the service management frameworks (SMF) as services rely more and more on cooperation between Dev and Ops personnel. The integration of development and operations activities forces organizations to reassess their business models. Organizations at times need to assess their business models to use Service-based models as Software as a Service (SaaS), and as DevOps has certain competitive advantages, it adds a lot of value as an integral part of the new model. Additionally, resources which in the past were owned by companies are today offered as services such as Platform as a Service (PaaS), Infrastructure as a Service (IaaS). As services heavily rely on seamless cooperation between the Dev and Ops teams, supporting DevOps principles in the SMF is beneficial. DevOps is a major change in Information System development. DevOps reduces the gap between developers, operations and the end user, allowing for earlier problem detection. In the past, after each Scrum sprint software would work according to specifications, but these would not be validated by the actual end user. 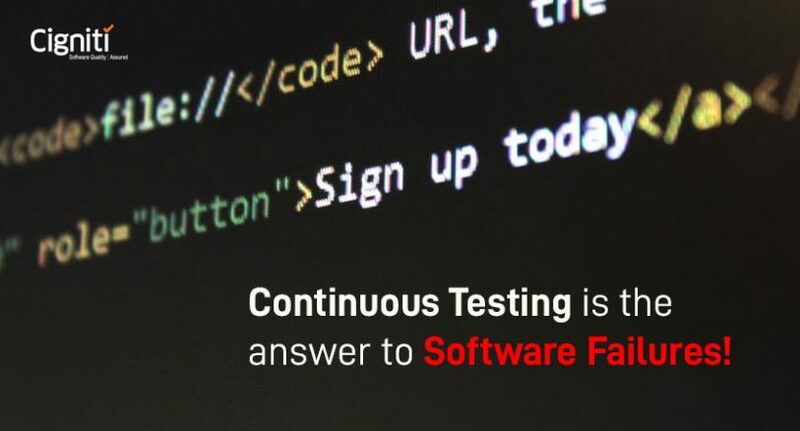 With DevOps, we can implement continuous development and release software to the end user frequently. DevOps also allows developers and operations to work together more efficiently and effectively. By encouraging cooperation between teams, people become empowered and feel more trusted and act more responsibly. By providing an overview of the software development pipeline, DevOps helps gain perspectives from both engineering and business angles. By helping implement continuous delivery, DevOps helps release software on demand. By exploring and adopting patterns and tools that support automation. By facilitating communication between the Dev and Ops teams to improve understanding. By creating shared knowledge management systems creates an atmosphere of centralized information. By propagating use of cloud services in your products that will simplify your network infrastructure. By making services as version control accessible for both Dev and Ops. By suggesting changes to your business model as required. By involving QA during the transition process. By making QA a stakeholder when considering reporting. By using Realtime User Monitoring to detect problems early. By setting up a centralized system during the transition to DevOps. By considering inputs from both Dev and Ops teams equally. By suggesting use of standards such as CMMI and ITIL. By helping implement established enterprise processes such as Disciplined Agile Delivery. DevOps practices thus help if you want to save on time and money, while increasing quality and time to market. Yes, it’s true that you may have to spend time and resources to setup automation. But done with the right partner and weighing the cost and benefits, this will be an investment for which you won’t regret. Click here to know more about Cigniti’s DevOps expertise. 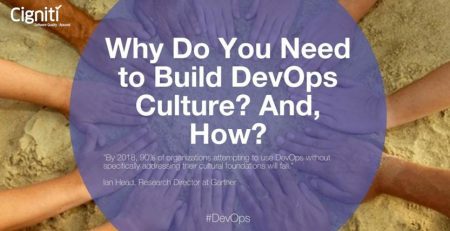 Why Do You Need to Build DevOps Culture? And, How? 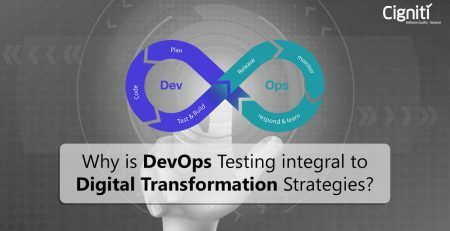 Why is DevOps Testing integral to Digital Transformation Strategies?